I watched these robins from the time there were just eggs in the nest until the babies flew away. Take a look. When I was younger I always thought that serious photography was beyond my means. I documented the kids when they were babies with an Instamatic and a Polaroid. 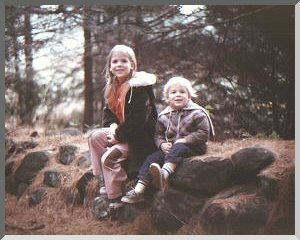 Then, in 1975 I inherited a used 35mm camera. I discovered that I didn't need fancy, expensive equipment. All I needed was a more versatile camera and a little imagination. Anyhow, all of the photography on these pages is my own. Most of the pictures were taken with 35mm cameras and the images were either scanned in from the prints, or lately, scanned right from the negatives during film processing. I have just recently acquired a digital camera, and the tiny LCD viewfinder has its advantages and disadvantages. What you see is what you get, but what you see is awfully small, and very hard to see in bright sunlight! The animations on my pages are taken from various places on the net, and so are the pieces of music you hear. The entire layout of the pages was done in "NOTEPAD", using only html tags. No editor was used. I like to do things myself, even if sometimes it is the hard way! Most of my photography is landscapes and still-life objects that can be posed. I have done some formal portraits, but I prefer the informal kind, as you can see below. I like a natural setting. I think Eddie was less than a year old here. I really can't remember if this was spring or fall. This was one of the very first pictures I took with a 35 mm camera. It was just a lucky shot. 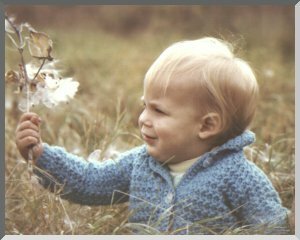 He's just sitting in an unmowed meadow, fascinated by the "parachutes" in a milkweed pod. I do believe Mother nature designed those seeds to be spread by kids. I must have a million pictures of my kids (doesn't everybody?) This is what many people mean when they say they took some pictures. The pictures have people in them. Kitty must have been about six here, and Eddie about two. They actually liked posing for these kinds of pictures. The formal type were a real ordeal to set up, and hold their interest. Being a photographer is a good excuse to have a website, and having a website is a good excuse to do some photography. And remember, it's not the camera that's important, it's what you look at through it! 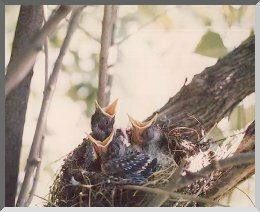 This entire website is my photo album, but if you'd like to see more of the baby robins, Click here!